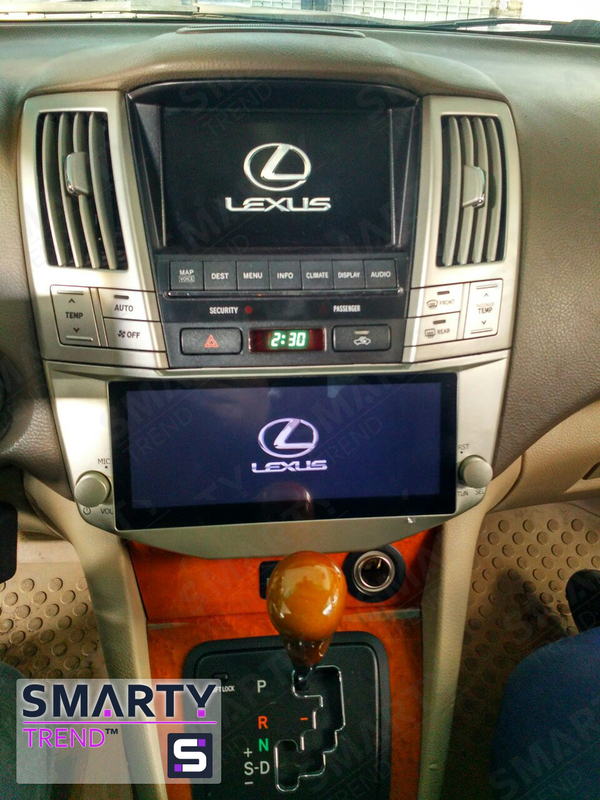 SMARTY Trend head unit overview for Lexus RX 2 2003. The Lexus RX 2 2003 - 2008 is an excellent representative of the premium class, even today, due to the build quality and materials. This car is ideal for trips in the city and beyond. Thanks to its technical characteristics, this car is popular even today. But there are a lot of problems associated with its functionality. The company SMARTY Trend will help you to pick up the head unit on your car. The installation of this unit SMARTY Trend passes without any problems. The main feature is that the standard screen of the device is fully preserved in the lower part. Display of the image of the standard camera is performed on the standard screen. Installing the radio is on the principle of the connector into the connector without any changes to the standard wiring, or changes to the standard system of the car. All SMARTY Trend radios are equipped with Android OS. Thus, you can install a huge number of not only all familiar programs, but also a special application for your car, which will undoubtedly be very useful in everyday use. Also, worth noting is the ability to connect hard drives and memory cards, which will allow you to have the necessary information at your fingertips. This feature is very convenient for daily use. Often there are situations where you need to use the navigation system, but at the same time did not want to interrupt the viewing of your favourite movies. Thanks to this function, you will be able to work in several applications in parallel on one screen. Despite the fact that this car is not new, thanks to the SMARTY Trend, now a huge number of new features are available that were previously unavailable. The quality, and the materials used correspond to the original. Due to the fact that the device is regular, it fits perfectly into the interior of the car. The main feature is that the standard system is preserved in full. The company SMARTY Trend will help you in choose the device, which is ideal for your car!